Wedding Insurance policies compared. View instant comparisons and tailor your cover around your ceremony. MoneyMaxim can help you find the policy that's right for your wedding. All policies can be adapted to add optional extras such as marquee cover, public liability or ceremonial swords. Please click the link above and select the value of cancellation cover you would like for your wedding insurance policy. 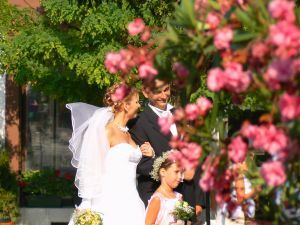 We regularly check the prices and policy features of these wedding insurance policies but please be aware that details contained in our comparison guide are subject to insurers making changes to their policies, so do check all details and terms and conditions carefully on the insurer's website as their policy documents always have priority over details on this site. The companies we review include John Lewis Insurance, Debenhams Insurance, InsureforWeddings, CoverMyWedding, E&L and WeddingPlan. This panel grows all the time, although, as a Financial Conduct Authority regulated company, we do carry out our own monitoring, review and feedback processes and will only feature companies in whom we have confidence. We therefore feature some of the biggest brands in Wedding Insurance, and companies that have a strong reputation in the wedding insurance market. The companies know what their customers need when it comes to wedding cover and are really strong players in the wedding cover arena. When spending thousands of pounds on wedding insurance it is extremely important to ensure that whatever happens, you are properly covered. Unfortunately every year we see weddings requiring rearrangement or amendment due to no fault of the bride or groom. Adverse weather conditions meaning guests cannot arrive, a fire at the wedding reception or the illness of the bride or groom are all reasons that your wedding insurance policy can come to the rescue. These policies insure all types of wedding so, whether your celebration is Roman Catholic, a Jewish wedding, an Asian wedding or Shaadi, you can find the protection you are looking for. They also cover Civil Partnerships and other celebrations such as Golden or Silver wedding anniversaries. We do recommend that you click through to the insurers' sites themselves as, although we have captured the headlines in your comparison, each insurer has their own 'additions', from counselling services, to wedding cake insurance.